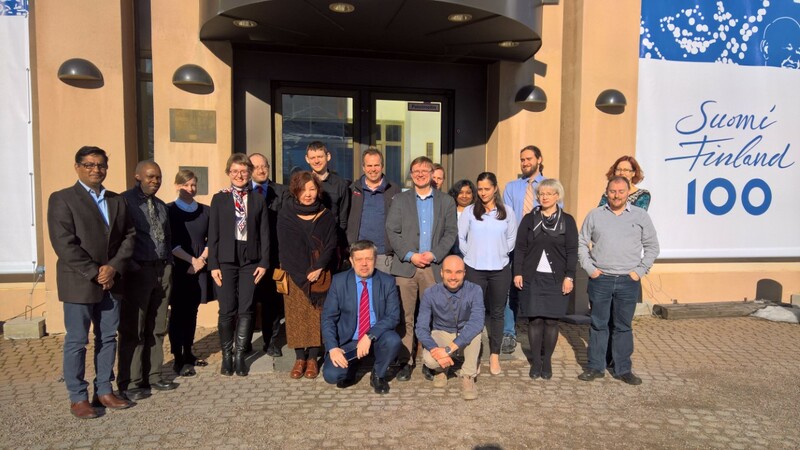 The Law Subproject held their first workshop, Laws and Regulations Currently Guiding Human Behaviour in Icy Environments, at the Arctic Centre, University of Lapland, Rovaniemi, on 8 April 2017. There were 23 participants, including three invited speakers. The workshop explored the ways in which laws and regulations currently guide human behaviour in icy environments. This issue was considered with reference to both international law and domestic and sub-national legal systems, such as those of Greenland, self-government in Denmark or Nunavut in Canada. The long-standing practices in the Baltic Sea for managing frozen marine environments were also discussed. These practical studies into how law has functioned in these icy environments provided the Law subproject, and the ILP as a whole, with a baseline of current practices that will guide further research. Although this workshop focused on sea ice, participants also began to draw examples from, and explore implications for, other natural environments that encounter similar challenges (e.g. snow-covered land, river deltas, etc.). This day-long workshop attracted seven academic presentations. Invited guests included: Richard Caddell, Senior Research Associate and a Nippon Foundation Senior Nereus Fellow in International Fisheries Law at Utrecht University; Michael Byers, Canada Research Chair in Global Politics and International Law at the University of British Columbia in Vancouver; and Viatcheslav Gavrilov, Professor of International Law at the Far Eastern Federal University, Russia. Three further speakers, all based at the University of Lapland in Rovaniemi, also gave presentations: Stefan Kirchner, Associate Professor for Fundamental and Human Rights; Timo Koivurova, Research Professor and Director of the Arctic Centre; and Anna Stammler-Gossmann, Senior Researcher at the University of Lapland and specialist in Arctic Anthropology. The opening address by Timo Koivurova, emphasized the aspects of geopolitics, the difficulty of a model law for sea ice, problems with regulations and law of the sea – and how it can be solved. He also mentioned the ‘Toxic splash’ that involved Russian dumping waste into the Arctic sea. There were two sessions, of which the first was chaired by Kamrul Hossain. Our first speaker, Richard Caddell, discussed “After the Thaw: Ice Retreat and the Emerging Regulation of Newly Exposed Marine Areas”. He highlighted diverging views, mainly on the Antarctic ecosystems such as ice shelves, anthropogenic activities and management consideration. He also commented on future issues including automatic protection, the potential extension of practice to thawing land areas, and opportunities for collaboration between the Antarctic and Arctic on the challenges faced by diplomats and scientists. Our second speaker, Michael Byers, spoke on “When the Ice melts: Will increased shipping bring the Northern Sea Route and Northwest Passage disputes to a head, or force their resolution?” His talk cited several legislative events, including: the role of the ICJ in the 1949 Corfu Channel case, the 1965 ice breaker dispute between US and Russia, and the aftermath of the SS Manhattan’s journey through the Northwest Passage in 1969. Stefan Kirchner’s talk addressed “Human dimension of the polar code”. He stressed the increasing popularity of the human dimension with changes to SOLAS and MARPOL, citing the Costa Concordia accident as a case in point. He also discussed the challenges of non-arctic seafarers not being aware of the region’s dangers and considered some of the human issues faced by seafarers, such as drug and alcohol abuse, loneliness, and the lack of daylight and internet access. The second session was chaired by Stefan Kirchner and the first speaker was Viatscheslav Gavrilov. His talk considered “Comprehension of the LOSC Article 234 in the Changing Arctic Environmental Conditions”. He debated the reasons for including Article 234 into the LOSC, in light of the possibility that the melting of polar sea ice will make northern routes navigable for more days. He stressed that the shrinking of ice does not imply a change to the national legal regimes applicable to Arctic waters based on Article 234 and that Russia ought to be actively involved in the decision-making process. Timo Koivurova’s talk, “Reflection on Ice and the Law of the Sea”, explored several thought-provoking questions around the topic of sea ice being treated differently in maritime legislation. He questioned the application of LOSC Article 234 to non-arctic waters and the consequences for the law of the sea in light of sea ice melt. He considered issues surrounding greenhouse gas emissions, polar bears, indigenous peoples and customary laws. Anna Stammler-Gossmann’s examined “Arctic Fisheries in the Context of Climate Change”. She emphasized the challenges of sustainability in a shifting environment and the standards of sustainability, citing data from Russian fishing grounds gathered in 1985, 2000, 2012, and 2014. She emphasized that, in the Russian context, sustainability acts a slogan for “stability” and the rational use of resources in the Soviet economic sectors. She advocated several strategies for change, such as adapting flexibly to changing environments, alternative fisheries management and the need for incentives. Michael Byers then concluded the session with a narrative, inspired by his son Cameron Byers, on the environmental impact of the three-stage ‘Rokot’ satellite launcher. Launched from Plesetsk Spaceport in Russia, the rocket stages return to earth covered in residual hydrazine, which then pollutes and kills living organisms in the polynya. In summary, the workshop examined issues mostly drawn from the law of the sea and the sea ice. The general sentiment was that the foundational rules of the law of the sea and general international law should not be revisited because stability and predictability are values that should not be sacrificed. It has been highlighted that the governance of sea ice and any other geophysical environments should be approached from these foundations, and that separate regulations and management should be sought only when clear problems arise. Michael Byers holds a Canada Research Chair in Global Politics and International Law at the University of British Colombia. His research addresses issues of Arctic sovereignty, climate change, the law of the sea, and Canadian foreign and defence policy. Michael is the author of Intent for a Nation and, most recently, Who Owns the Arctic? Richard Caddell is Senior Research Associate and a Nippon Foundation Senior Nereus Fellow in International Fisheries Law at Utrecht University. His primary research interests lie in the law of the sea and international environmental law, with a particular emphasis on fishing and conservation. Richard regularly acts as a legal advisor to governmental bodies and NGOs on environmental and marine issues. Viatcheslav Gavrilov is Professor of International Law at Far Eastern Federal University. His research focuses on international law in the public and private spheres, and he has recently published on the concept of the ‘continental shelf’ legal category. Viatcheslav has recently headed the scientific working group of FEFU’s law school for International Law of the Sea and the Arctic Studies. Stefan Kirchner is Associate Professor for Fundamental and Human Rights, with Special Focus on Indigenous Rights, at the University of Lapland. His recent research centres on human rights and legal aid, and international environmental law. Stefan became Co-Chair of ASIL’s Law of the Sea Interest Group in April 2015. Timo Koivurova is Research Professor at the University of Lapland and became Director of the Arctic Centre in 2016. His current research addresses the interplay between various Arctic-based topics, including law, climate change, maritime policy and the legal status of indigenous peoples. Timo has been involved as an expert in several international processes, both globally and in the Arctic region, and leads ICE LAW’s Law subproject. Anna Stammler-Gossman is Senior Researcher at the University of Lapland and a specialist in Arctic Anthropology. Her research engages with issues of climate change and human activities in the Arctic, human-animal relations and sustainable development. Anna has undertaken fieldwork in Argentina, Russia and Norway, and will be leading a community meeting in Bugoynes later this year as part of ICE LAW’s Indigenous & Local Perspectives subproject.